Whenever I think of brunch I think of bagels, donuts, and pastries. These are all things I usually buy at the store instead of making myself. 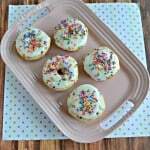 I do make baked donuts on occasion because they are fairly easy but I hate the mess of making fried donuts. Bagels are another thing that I’ve made but it takes a while because you have to boil them and then bake them. They are totally worth it but just a pain to make so I prefer to buy them. The one thing I haven’t ever made is Danish. I love a good fruit Danish with a tasty glaze on top but I haven’t been brave enough to make one on my own. Part of the reason is that the pastry dough takes time to make and has several steps that include many rest periods. This means I have to make it on the weekend when I’m not working so I have time to do all of the steps. This year for BrunchWeek I was determined to make a braided pastry bread. We received Platinum Red Star Yeast which is my absolute favorite yeast to work with when making breads and desserts. It is so easy to work with and rises perfectly every time. 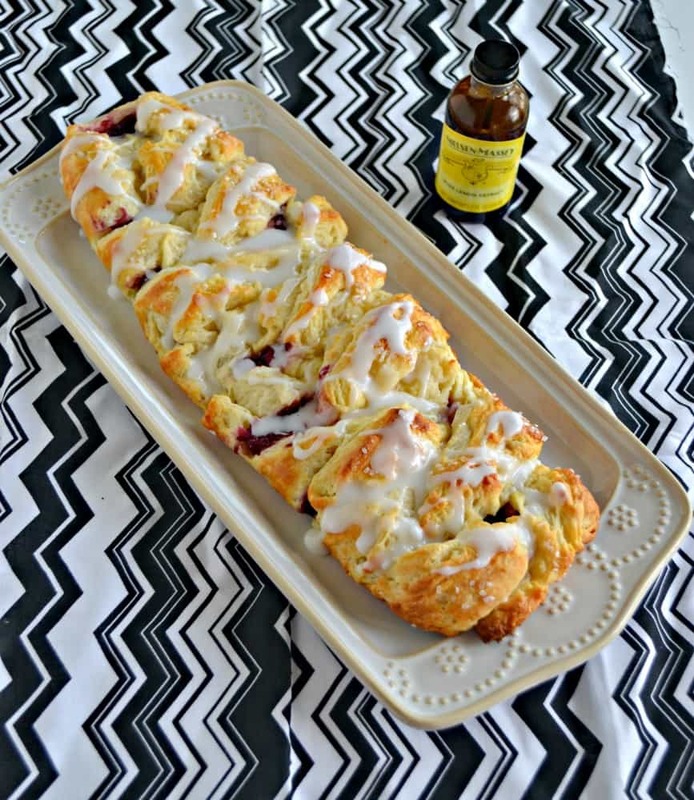 Today I’m sharing my Iced Berry Breakfast Braid. I know I said I love a good fruit pastry but I’ve never had one like this! Making your own pastry dough is totally worth it. I really didn’t think it would make that much of a difference but it makes all the difference in the world. The pastry bakes up buttery, flaky, and golden brown. It’s like eating a buttery cloud. The inside of the pastry has a homemade berry jam. I made it with blueberries, strawberries and blackberries because that’s what I had in the refrigerator and I really liked the sweet and tart combination. 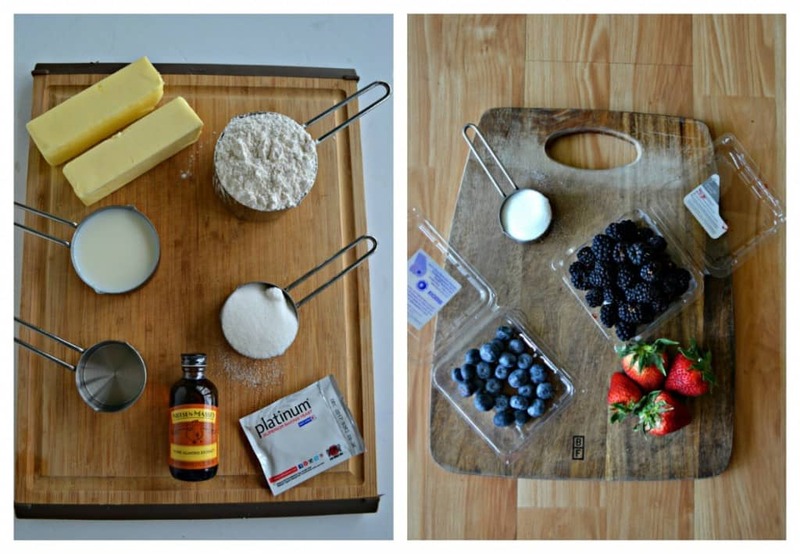 However, you can make it with a single berry or whatever berries you like best. I find it best to make it a few hours ahead of time so it has time to cool and set. Once the dough and jam are made putting it all together is easy. In fact, you can make the jam and dough a day ahead of time and then put it together the day you need it. It tastes best the day it is baked so if you are having people over for brunch I recommend you make everything the day before and then bake it the day you are serving it. That’s not to say it doesn’t taste delicious the next day, it’s just not as crisp and flaky. This Iced Berry Breakfast Braid is a real show stopper. The buttery pastry combined with the sweet and tart jam is just out of this world. As if that wasn’t enough I decided to make a lemon glaze for the top using Nielsen-Massey Pure Lemon Extract . You can certainly make the glaze whatever flavor you’d like but I thought the lemon paired well with the berries. 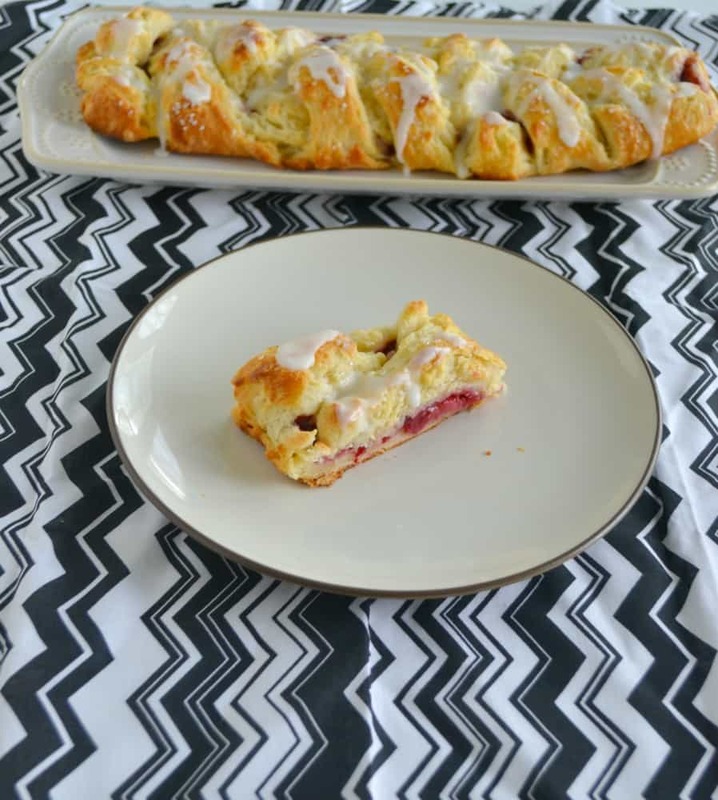 So the next time you are hosting a brunch at your house don’t forget the Iced Berry Breakfast Braid. Your guests will thank you for it! 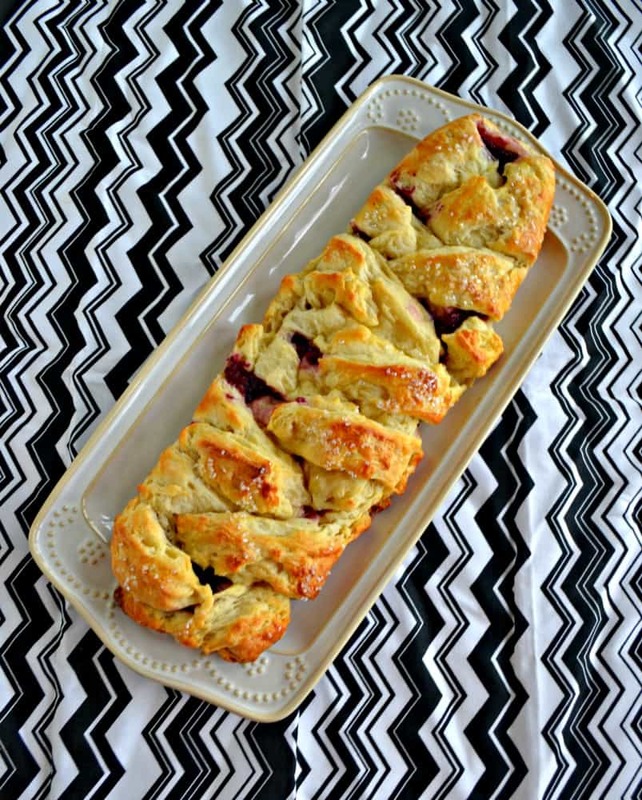 The flaky, buttery pastry crust filled with homemade berry jam is the ultimate breakfast recipe! In a large bowl combine the yeast and warm water. Allow to sit for 5 minutes. Add in the milk, egg, sugar, salt, and almond extract. Mix until combined. Cut the butter into half in pieces and place in a food processor. Pour the flour over top of the butter. Pulse 10 times or until the mixture looks like coarse, damp sand. Pour the flour mixture into the wet ingredients and gently fold until the mixture just comes together. Wrap the dough in plastic wrap and refrigerate for at least 4 hour or overnight. Once dough has chilled unwrap it and place on a floured surface. Pat it into a square and then roll it into a 15 inch by 8 inch rectangle. Fold the bottom up about ¾ of the way. Then fold one side halfway in, fold the other side halfway in, and then fold the top down to the bottom. It’s like folding an envelope. Push into a flat square again and roll back out into a 15 x 8 rectangle. Repeat the folding. Do this a total of 5 times. The dough will be speckled with pieces of butter. After folding the last time wrap in plastic wrap and refrigerate for at least 1 hour or overnight. Once the dough has chilled remove it from the plastic wrap and cut it in half. Place each half on a sheet of parchment paper. This will make it easy to transfer the dough to a baking sheet. Roll each half into a 12 x 6 rectangle. 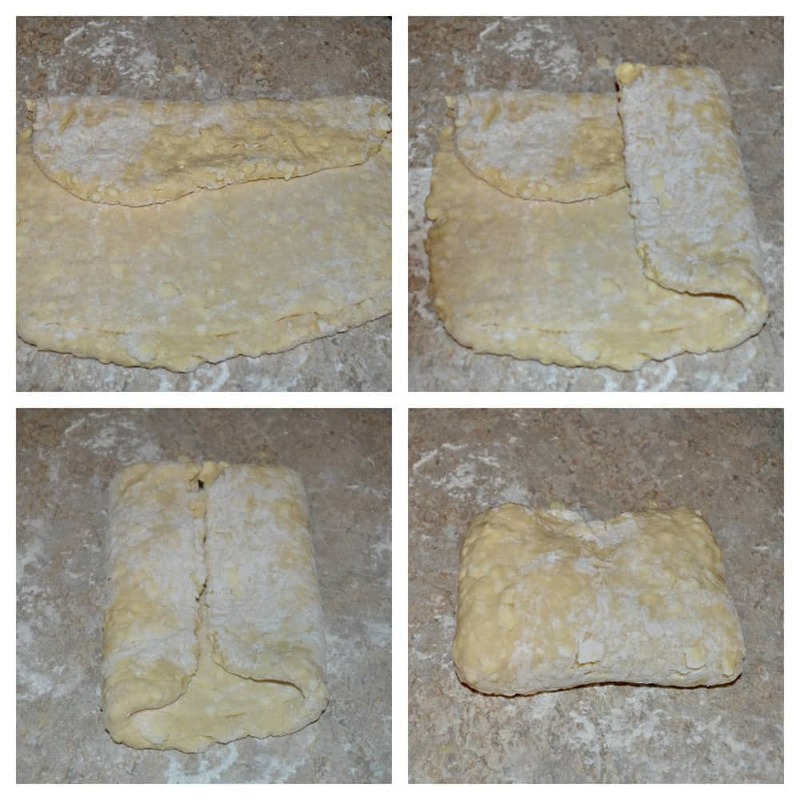 Cut inch strips on each side of the dough leaving 3 inches in the middle without cuts. 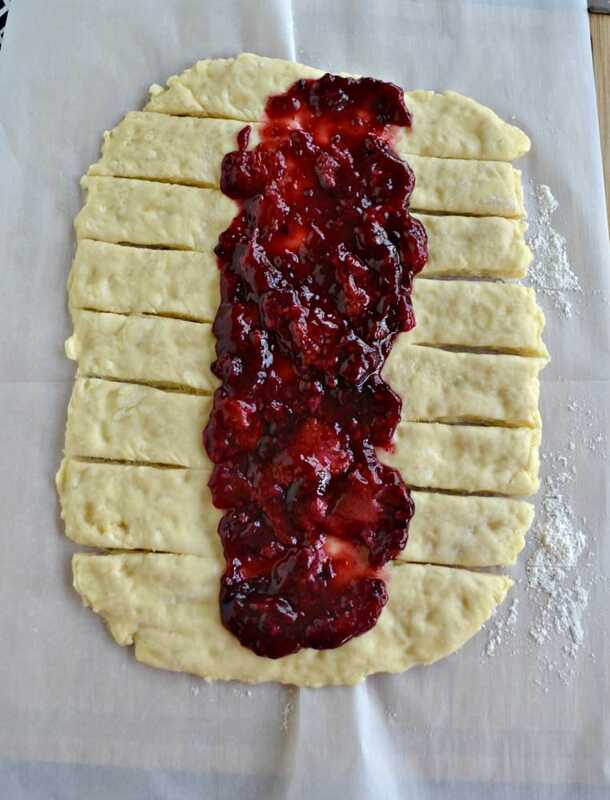 Spread half of the berry jam in the middle strip of the dough. 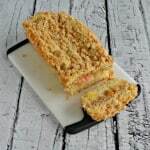 Carefully braid the dough by taking a strip from one side and pulling it over top of the filling and placing it on the other side of the dough. Then take a strip from the other side and do the same thing. Repeat until all the strips have been used. Pinch the top and bottom seams to keep the jam inside of the dough. Preheat the oven to 400 degrees and allow the braided bread to rest for 20 minutes. Using the parchment paper transfer each braided bread to a baking sheet. Mix together the milk and egg to form an egg wash. Brush over tops of both braids and then sprinkle with sanding sugar. 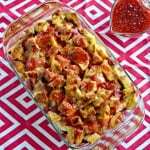 Bake for 15-18 minutes or until the tops are golden brown and flaky. Remove from oven and place on a wire rack to cool completely. To make the icing combine the powdered sugar, lemon extract, and milk. Mix well and then drizzle over top of the bread. Slice into pieces and enjoy. Don’t forget to enter the #BrunchWeek giveaway! Check out the prizes at the bottom of this post then enter the Rafflecoptor below. YOu should be very proud. That is gorgeous. Thank you! It was so delicious too! This is so pretty! I am not confident that my braids would look this gorgeous!